I had driven past RobZFitness many times. I thought it was a place where only elite athletes trained, not a stay-at-home mom like me. Then one of my best friends decided to start training there. 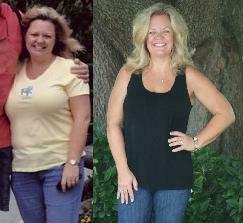 She encouraged me to look at the testimonials on the RobZFitness website. I’d been struggling for so long, pretty much all of my 30’s. I had tried all the diets, bought all the books and worked out on my own. Still, here I was, about to celebrate my 15 year anniversary, turning 43 in a few months with a wonderful husband, beautiful sons, amazing life and family, but still not happy with my weight. It was time to change! It was a big wake-up call to be evaluated and find out just how out of shape I had become. I was exercising and thought I at least had some amount of fitness. My body fat was 37%, this was not good. I was only in better shape than 6% of women my age! It was not just about wearing a smaller size, but getting healthy. The supportive eating plan was the easiest diet I had ever followed. Right from the beginning, Rob let me know to ask him questions; he was there to support me. I would go in with my little lists almost every day in the beginning and really felt he taught me “how and why” to eat for best results. The workouts were challenging and rewarding. I used to enjoy lifting weights and was thrilled to find that joy again. It was such a huge sense of accomplishment during one of my workouts when I did 100 push-ups for the first time. Not ‘girl’ push-ups either! Real ones, on my toes! Weight came off immediately. After two weeks my clothes were looser. After a month I could wear one size smaller. Fortunately I waited before buying a lot of new clothes, because at the end of 2 months I needed an entire new wardrobe and was down from a tight 12 to a very comfortable 8. Everything Rob had said during our first meeting was true, I was losing weight, feeling great and it really was not that hard to do as long as I just followed his fitness plan! I went on 2 different vacations during the first 2 months, stayed on the eating plan and managed to work out and lose weight! My “before” picture was taken a day before I started at RobZFitness. I just cannot tell you how great it feels to have lost 15% of body fat, gained muscle, lost 20 inches in size all over and now I am in better shape than 76% of women my age. I am really on my way to excellent health and fitness. Back in March before I started, I never thought I would lose 34 pounds of fat in just 3 months. It is the best gift I could have given to myself and my family…taking care of myself.